It's fascinating to see the most public face of this legendary private figure. What we hear in this collection is not just the evolution of his music (including many rarities), but the persona(e) that he has crafted for audiences over the years. As much of a self-conscious chameleon as David Bowie, each year in Dylan's four-decade career has usually heralded some kind of stylistic shift. After the upbeat religious revival of the album opener, "Somebody Touched Me" (from 2000), the disc jumps back to the early 60s, where he’s singing traditional folk tunes in his native Minnesota (dig the guitar on "Wade in the Water,” 61), and later around Greenwich Village (the understated "Handsome Molly,” 62). He then caught the ear of Columbia Records, and although we miss his wonderful April 63 Carnegie Hall show, the story picks up with the self-assured "To Ramona” (65), later heard in Don't Look Back. Wisely skipping the infamous Newport 65 show, Live continues on to his 1966 tour with the Band, and from then on, all his shows would invariably be rock concerts. From the English 66 tour, there's the cocky, confident "I Don't Believe You." 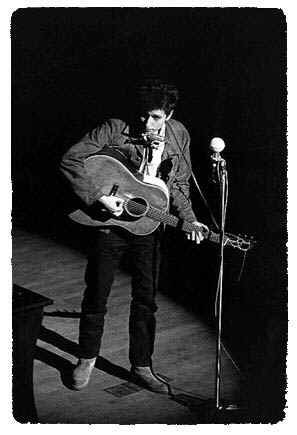 After a motorcycle accident sidelined him that same year, Dylan’s live appearances were rare: a fun, drunken version of Woody Guthrie’s “Grand Coulee Dam” at the 68 memorial show covers that period. Finally ready to hit the road with the Band in 74, his mannered, over-projected delivery on "Knockin' On Heaven's Door" sounds like he's playing to the arena crowds. The subsequent, freewheeling Rolling Thunder tour produced music that wasn't as tight (a messy "It Ain't Me Babe,"'75), though not without its moments (the crunching guitars of "Shelter From the Storm," 76). The rollicking and selfless performance of "Dead Man Dead Man" (81) manages to display his old conviction sans the ego. Skipping over most of the late 80s (and unfortunately, his tours with Neil Young and Tom Petty), we get one of his religious standards (87s "Slow Train”) with the Grateful Dead (better heard in the original version with Mark Knopfler). Leapfrog another seven years and he's doing MTV Unplugged (94) with a voice that's clearly strained. Still, "Dignity" has a rolling, easy feel that's upbeat and fun. Dylan has enjoyed a renaissance lately with the Grammy-winning Time Out of Mind (1997), and he got an Oscar (for “Things Have Changed”) to boot. Lately, he's been playing lead guitar in live shows, and aging more gracefully than his other 60s compatriots. The stomping blues of "Cold Iron Bounds" (97) fits perfectly with the somber, late-night ambiance that has pervaded his recent live performances. The album ends at a 2000 English concert with "Things Have Changed,” an appropriate ending place that places his earthly and religious urges together in context. No matter what you think of his voice or lack thereof, Dylan has survived, thrived and is at the top of his game, even if he is more a legend than a messiah now. Certainly a fitting tribute to a complex artist, this live collection will hopefully introduce a slew of subsequent live recordings that have remained in the vaults for too long.